When Gina Lopez was finally rejected as DENR Secretary by the Commission on Appointments (CA), lots of conspiracy hypothesis were flying. And one thing I notice about these comments and opinions is that it seems all of the people who spread such opinions did not watch the 2 1/2 hours CA hearing of Gina last May 02, 2017. 1. Simple questions answerable by Yes or No, Gina cannot answer. Her mind and mouth is full of emotions, little or nothing on specifics, numbers and law. 2. Three questions by Sen. Alan Cayetano: (a) how much of total PH land area is actively mined, (b) beach resorts, how much of total coastal land of the PH have beach resorts, (c) what are the standards and criteria for her recent orders on mine closure — she could not answer. 3. Questions on land multiple titles involving DENR corruption resulting in perennial land grabbing problem raised by 3 Congressmen, what she’s doing about it in her 10 months in office, she was clueless, no specific answer, only generalized ones like “we are cleaning up the department” or “we are computerizing things.” She can suspend or close down many mining firms that follow certain regulations but she cannot suspend or kick out any corrupt officials in her department the past 10 months. 4. Question on very dirty rivers like Marilao river, Pasig river, she answered “structural problems” daw, despite heading the Pasig river clean up commission. She has no specific plans to clean up these rivers. 5. Questions on unabated logging, she has no clear answer. 6. Questions on legal basis, what existing laws, as basis for her recent AOs (Administrative Orders) on P2M/hectare of “disturbed” agri land as deposit — no answer. She argued “my prerogative” as Secretary. Congw. Josephine Sato who insisted on this issue is very specific in her points — “we are a nation of laws, not of men”. Our actions and policies should be based on existing laws, not on whims of men/women leaders. Bright legislator. DENR work is more than mining. She’s very hard-working, very passionate, only in anti-mining campaigns. But she’s lazy on other mandates of the DENR. Gina's big problem is her big ego. I liked Congw. Sato’s rejection of Gina’s “my prerogative as Secretary” answer to her question. Department Secretaries cannot legislate on their own, otherwise Secretaries of DA, DOTC, DPWH, DSWD, DAR, etc. can just issue dozens of AOs or Department circulars (DCS) creating new prohibitions and regulations, new fines and penalties, new subsidies and entitlements — all bypassing Congress as legislative body. PDu30 made a mistake in appointing her as DENR Secretary even without fully scrutinizing her work ethics, her technical skills. Du30 corrected this mistake by not defending her at the CA. People who oppose mining and argue “zero mining” are as confused as the people who say “zero fossil fuel”. These people should be riding bicycles or skateboards or just walking/running, or riding horses, cows, ponies. They should not ride cars, jeeps, buses, airplanes, ships because all these use fossil fuels 100%. People who say “zero mining” don’t want to live in caves. Even barong-barong use mining products like nails, hammer, saw, bolo, etc. Hypocrisy always finds some scapegoats like the “oligarchs”, as if the Lopezes are not oligarchs. 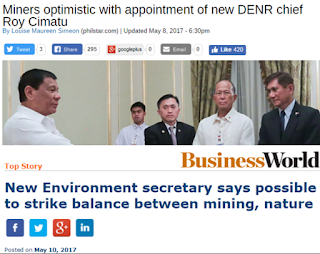 Last Monday, May 08, former AFP Chief Roy Cimatu was appointed as new DENR Secretary by President Duterte. A retired soldier, then labor diplomat in the Middle East, and now a DENR chief. Perhaps near-zero official experience in managing an environment agency except in some tree planting activities of the AFP, his appointment is a guessing game for many sectors under DENR supervision — mining, forestry, solid waste, air pollution, coastal resources, rivers/lakes/sea water quality, land titling, etc. Since all Cabinet posts are political appointees of the President, then it is assumed that the major policies of the appointed Secretary are also the policies of the President. I am not a fan of “good governance” in a BIG government because it is a contradiction in terms. Big government almost always lead to bad governance because government would over-extend its power of coercion. Like creating a dozen new regulations on top of hundreds of regulations, laws and prohibitions that are already in place. That is what former DENR Secretary Gina Lopez did, creating new department regulations (administrative orders (AOs), department circulars (DCs), etc.) that pile up new requirements on top of existing ones, resulting in the closure and/or suspension of many mining firms. The big question now is whether the new DENR Secretary will focus on the rule of law, enforce existing laws and regulations before creating new department orders or seek new laws in Congress. Like the laws regulating small-scale mines and quarrying equally implemented as the laws regulating large-scale metallic, non-metallic mines and quarrying. This act alone of focusing on the rule of law will be a big improvement in the department and in the national government as a whole. A better situation of course is that many existing regulations that are “out of tune” are abolished, or consolidated with others so that instead of having 10 “out of tunes” AOs, DCs and other department orders, they are consolidated into one AO that is more “in tune” with the times.